Shop FamilyLife - Fight Fair! Everyone disagrees on some things; this is inevitable. The question is, how can we disagree with those we love, but increase the odds that we will live and love to fight another day. How can we learn to Fight Fair? When couples fight, tempers flare, tongues loosen, and behavior occurs that can cause major damage to the relationship. Fight Fair! teaches couples how to have healthy disagreements. It is a candid and realistic "rulebook" for married couples to ensure that their conflict is God-honoring and respectful of their partner. There is also plenty of immediate application to ensure that future conflicts don't create permanent scars. Tim and Joy Downs have been on the staff of Campus Crusade for Christ since 1979, where they founded and directed the Communication Center, a communication training facility, for seventeen years. Since 1985 they have spoken at more than 150 FamilyLife® Marriage and Parenting getaways across the country. 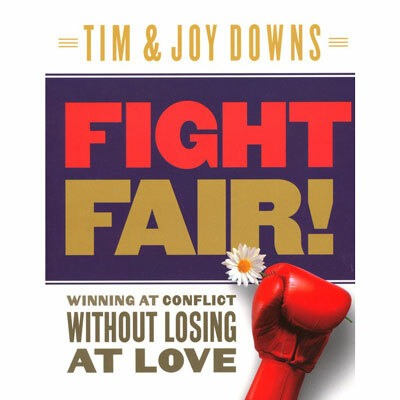 Tim's first book, Finding Common Ground, was awarded the Gold Medallion Award in 2000.